THE CROSS TOUR 2 DUAL SPORT MOTORCYCLE HELMET IS PACKED WITH EVERYTHING YOU NEED FOR YOUR NEXT GREAT ADVENTURE. The newly redesigned Cross Tour 2 is the ideal choice for any motorcycle or off road rider with its exceptional design, full face coverage, cool comfortable fit, and incredible value. The Cross Tour 2 full face helmet is loaded with features and packed with protection, featuring a multi-channel air flow system with switch air vents, intakes, and exhaust ports, removable / washable max-flow comfort liner, high density fully vented EPS with strong lightweight polycarbonate shell, removable drop down sunshield, and a removable outer shield. ; Removable & vented top visor, removable inner drop down sunshield, & removable outer shield. ; Full face matte black design with a true to size fit & even weight distribution. ; Washable, replaceable max-flow plush liner. ; Weighs only 3.5 pounds, eliminating neck fatigue. ; DOT & ECE approved helmet offers world class protection at an affordable price. ; 5 year limited warranty & guaranteed to be free from defects in materials & craftsmanship for the lifetime of the helmet. The Cross Tour 2 is in stock and ready to ship. Get yours today. COOL & COMFORTABLE - The Cross Tour 2 is lightweight, comfortably snug, and incredibly breathable to ensure you stay cool and comfortable while dirt biking, riding your ATV, motorcycle, MX, Motocross, Enduro, Quad, and wherever life takes you. 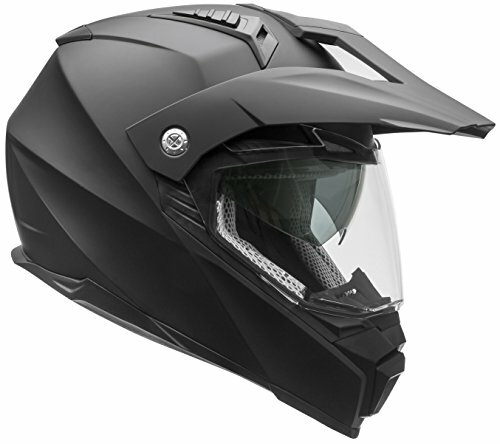 TECHNOLOGY PACKED - The Cross Tour 2 Dual Sport Full Face Helmet features an advanced polycarbonate ABS shell with controlled air vents and exhaust ports, drop down sunshield with the flip of a switch, padded D-ring strap, and washable / replaceable / removable max-flow comfort liner. SAFE - The Cross Tour 2 Adventure Helmet meets or exceeds US DOT standard FMVSS 218 & ECE R 22.05 and is engineered with a thick, high density fully vented EPS liner to greatly absorb impact, limiting the amount of force transmitted to your head. 5 YEAR WARRANTY - Your Cross Tour 2 Helmet is backed by our industry leading 5 year warranty.